Mascarpone is a triple-cream cheese made from crème fraîche, denatured with tartaric acid. Sometimes buttermilk is added as well, depending on the brand. After denaturation, whey is removed without pressing or aging. One can manufacture mascarpone by using cream, tartaric or citric acid, or even lemon juice. 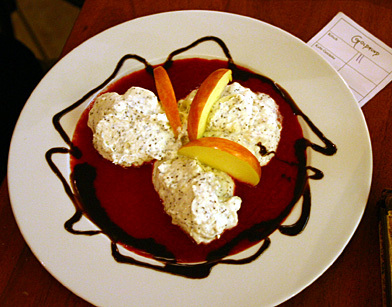 Mascarpone is milky-white in color and is easily spread. It is used in various dishes of the Lombardy region of Italy, where it is a specialty. It is a main ingredient of tiramisu. It is sometimes used instead of butter or Parmesan cheese to thicken and enrich risotto.